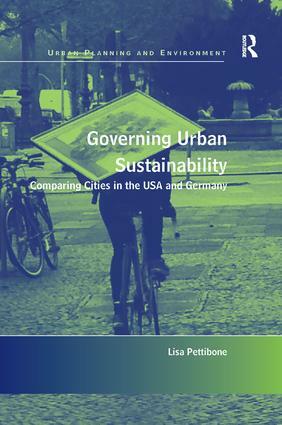 In her study of the interactions between tools of urban sustainability governance in key cities, Lisa Pettibone argues that a new factor-sustainability-minded groups-may be critical to building momentum for sustainability. The book presents in-depth case studies of six cities in the USA and Germany: New York, Portland, Seattle, Berlin, Hamburg, and Heidelburg. Drawing on 75 interviews, document analysis, and a bilingual literature review, the book analyzes how sustainability is politically constructed in city strategic plans and sustainability indicators. The volume provides a comprehensive introduction to the principles of sustainability, discusses the key governance instruments relevant to urban sustainability, and delivers new empirical and theoretical material on their role in a sustainability transition. It concludes that despite the national-level differences, cities’ experiences in both countries are similar. Political sustainability at the city level differs in several important ways from academic principles of sustainability. Finally, it proposes that sustainability-minded groups may be a key link to connect urban sustainability in practice to theoretical concepts.